The winner of Kelly Brozyna’s new book, The Spunky Coconut Grain-Free Baked Goods and Desserts has been posted here. 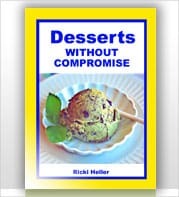 Here’s another chance to win a great desserts e-book, this one from the creative, comedic, and lovely Ricki Heller of Diet, Dessert, and Dogs. Her newest cookbook is Desserts Without Compromise. Read my review, see photos of her fudge recipe that I made, and enter the giveaway here. 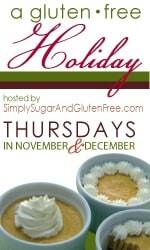 Don’t forget A Gluten-Free Holiday ends this Wednesday, December 22. There are more desserts … and cookbooks! Enter your favorite dessert recipe and enter to win Stephanie O’Dea’s soon-to-be-released More Make It Fast, Cook It Slow: 200 Brand-New, Budget-Friendly, Slow-Cooker Recipes or Amy’s Simply Sugar and Gluten-Free: 120 Easy and Delicious Recipes You Can Make in 20 Minutes or Less that also will be released very soon. Head over to visit our gracious hostess for the event, Amy herself. 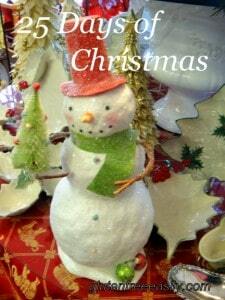 Still catching up on previous 25 Days of Christmas posts? Here are all the links below. Thank you for all your hard work keeping us eating well and gluten free. Hey Karen–I know I briefly replied to you re: this comment on the other post, but wanted to thank you again here for your sweet words! Admittedly, I’ve lost some steam on this event and it may take me the full 31 days of December to get in my 25 days, but it will happen. 😉 I’m so glad you’ve been enjoying the posts, but bummer on getting hammered with the weather.